All They’re Cracked Up to Be 2: Rice and Easy | Food It Yourself! It should come as no surprise to regular readers of this blog that I love cooking. However, I have a complicated relationship with recipes. I really, really try to follow them precisely the first time I try them. However, there is always that temptation to add a little of this or a little more of that. Yes, there are some failures. There are also major successes which are non-reproducible as I don’t usually keep notes of my adjustments. This is very difficult for Mr. Food It Yourself. While looking for tasty snack recipes, I came across this awesome Instructable. 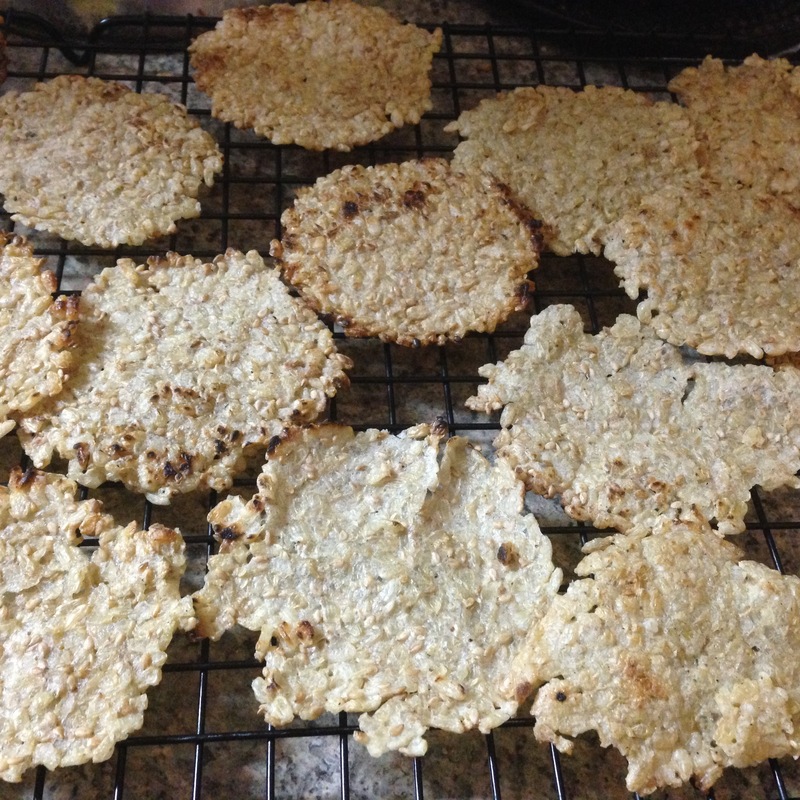 http://www.instructables.com/id/Rice-Crackers/ It is not so much a recipe as guidelines for creating a customized home-made snack. There is nothing I do not like about that! I started with some brown short grain (sticky) rice, because that is what I had on hand. (Bonus points for not having to hit the supermarket for ingredients I don’t usually use.) It was a long and pleasantly messy process, but the ultimate results were wonderful! Here is a pictorial of the process. My advance apologies for the drab color scheme of the photos. 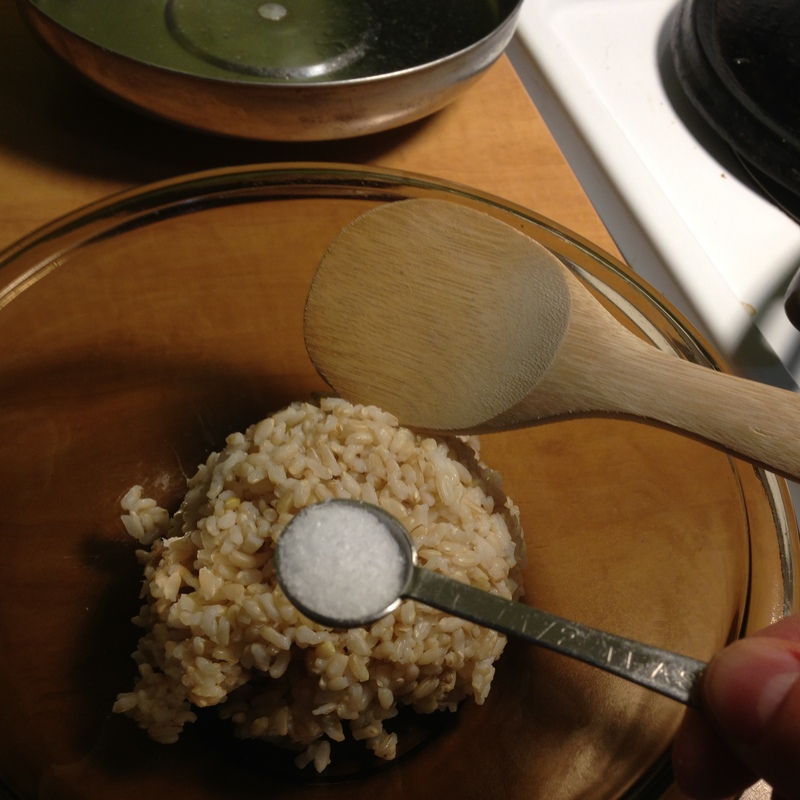 I made sure to measure the amount of salt I added to the rice. Half a teaspoon to one cup of cooked rice seemed to work just perfectly for my taste. I made a one cup batch of crackers with salt and a few grinds of black pepper. They were simple and delicious. For subsequent batches I added the half teaspoon of salt as well as one tablespoon of sesame seeds. Sesame and rice are true culinary friends. 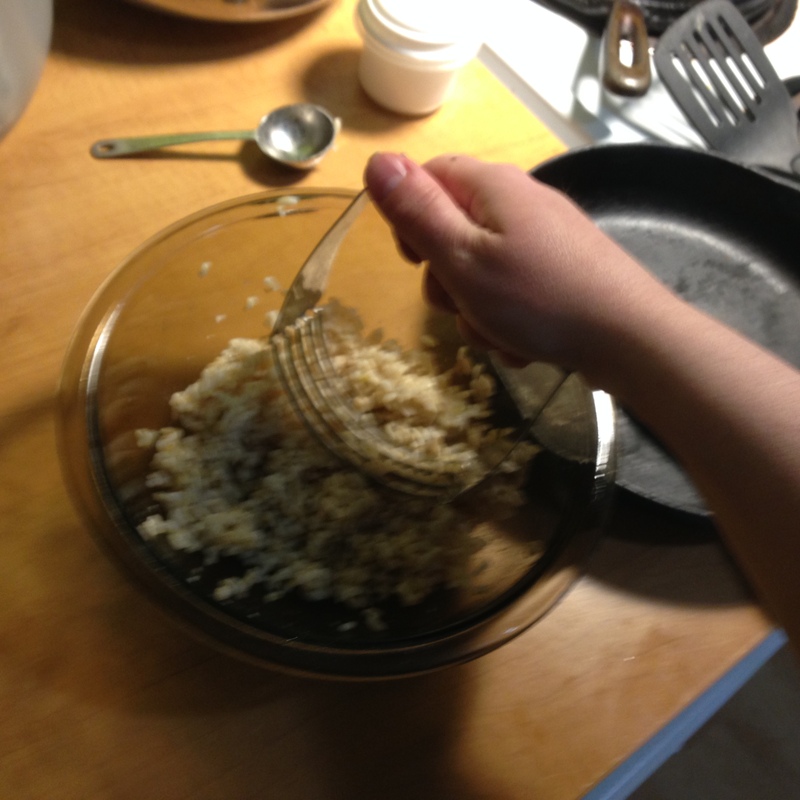 To get the rice to stick together I mixed the seasonings in using my trusty pastry blender. It cut through the husks of the brown rice, exposing the adhesive nature of the starch within each grain. It took a few tries, but I figured out a way to make forming the crackers easier. I used a sandwich bag split open on three sides. I wet my hand and the bag with water. I rolled a little ball of rice in my dampened hands and but it between the layers of the bag. Then I smashed the ball with my smaller cast iron skillet.The weight of the skillet did all the work! 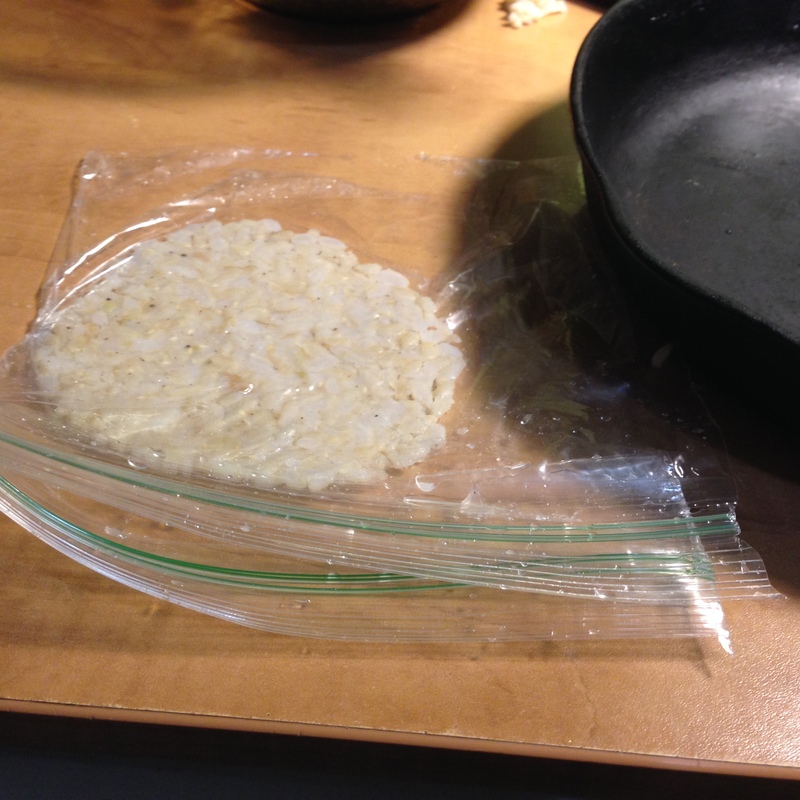 Peel the plastic back from the smashed rice ball, transfer the rice circle to a still-damp hand, and slip into the big cast iron skillet. 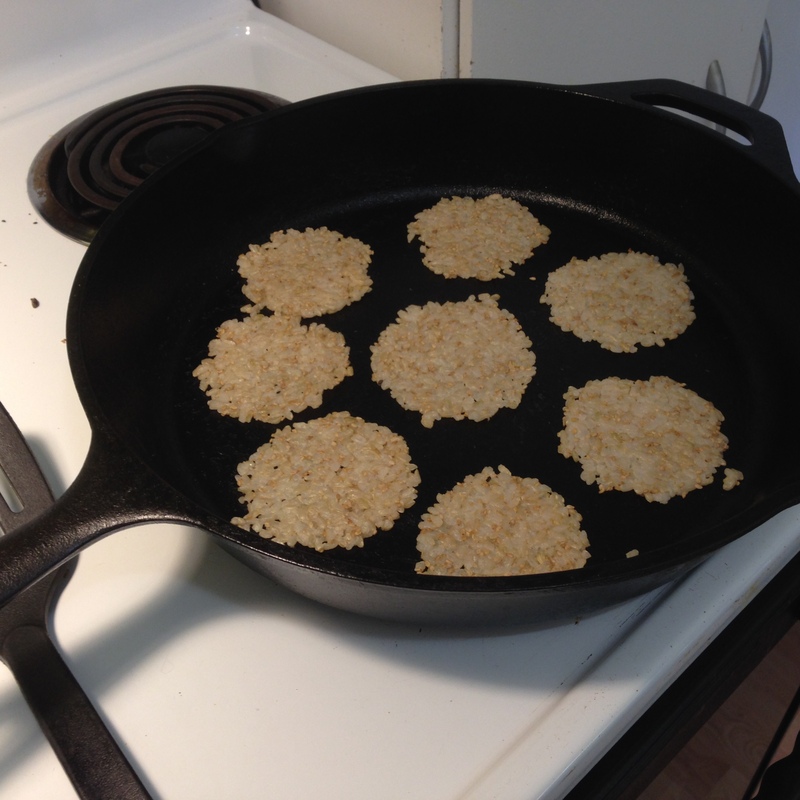 Well seasoned cast iron is an amazing thing., The starchy patties did not stick, no oil required. The skillet did a great job of setting the starch in rice, but there was still some water to be driven off after the exteriors were toasty brown, Fifteen to 20 minutes in a 250 degree (Fahrenheit) oven left the crackers perfectly crisp. These crackers are terrific! The flavor options are vast. I’m already imagining other spice blends I could add: Old Bay seasoning, Madras curry, garam masala, pumpkin pie spice (yup, I’m that girl), flax seeds, Italian seasoning…I could go on, but you get the idea. Best of all, I only made one batch and I have a solid grasp on the basic recipe-one cup of cooked rice and half a teaspoon of salt. You really should give these a try! DIYeters thrive on homemade snacks, and these are super easy to tweak to your own liking.